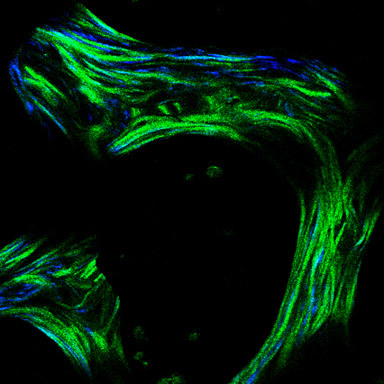 Image from a healthy female mice vertebra showing, within each trabecula, the collagen content evaluated by the fraction of area occupied by both immature collagen fibril segments (blue) and mature polymerized collagen (green). The aim of the Rheumatology Research Unit is the study of the pathogenesis of inflammatory joint diseases and bone disorders in order to characterize potential tools for early diagnosis and prognosis, and potential targets for novel therapies. Ongoing research projects are devoted to the study of neutrophils and B cells in very early arthritis and to the relevance of TNF-alpha polymorphisms in the prognosis and pharmacogenetics of several inflammatory joint diseases. In the context of the collaboration with Instituto Superior Técnico this Unit is also involved in research in the field of bone and soft tissues biomechanics. This unit will also be involved in clinical trials and epidemiological studies, in providing services to the community and in postgraduate teaching. Our images were collected on a ZEISS LSM 510 Meta.